Our new plush bear loves candy especially this time of year. He dawns his cat costume and whiskered mask and sways and moves his mouth to the song "I Want Candy." He might not win the best costume contest, but sure cute enough to delight those trick or treaters. Bear measures 19" and requires 3 AA batteries included. Fun for children and adults! Place your coin into the mouse's cart and watch in amazement as the mouse moves into the barn just excaping the grasp of the watchful cat, only to appear again with a empty cart. The action happens as the coin is deposited and fun music plays. Great way to save money! Bank measures 5" x 5" x 4" and requires 2 AA batteries (not included). For ages 5 and up. Want a off color way to hold your pen? 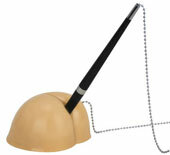 Let our wacky pen holder lend a helping hand. Each time you place your pen in the special place in the holder, you'll hear funny farting sounds. Fun gift to give or receive. Holder requires 3 AA batteries included. He's even more fun than a barrel of monkeys! Just wave or walk in front of this hilarious motion activated plush monkey to watch him jiggle and laugh uncontrollably. His laughter can be contagious! Monkey measures 14" long and requires 3 AA batteries included. For 12 months and up. Mix up some pretend-play fun with this Chet the Cat countertop mixer featuring scruffy surf cat Chet and his furry friend Parfait Poodle! This 2-speed toy mixer comes complete with 2 sets of beaters, lights, sound effects and real spinning action which is safe enough for even the tiniest fingers. 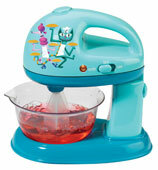 Mixer requires 2 AA batteries (not included). For ages 3 and up. Pop 'Em on Your Keys or Backpack!Just squeeze the pig or cow's belly and the string-attached ball pops right out, so the ball never rolls away. Pig or cow sold separately. Collect them both for a poppin' fun time! Have you seen our kitty? This hilarious little kitty has it's tail hanging out of the bag. Just press the button inside the bag and watch the bag roll. It even has a Velcro closure so the bag will stay closed. As it rolls around the cat appears to be fighting to get out! Please! Someone please let the cat out of the bag! The bag is a paper sack that is 5"x9" with a 3" gusset. Bag requires 1 AA battery (not included). A sure delight for young fans of the latest Disney classic! Lift the lid, and this sweet music box plays "Do You Want To Build A Snowman." 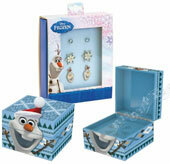 Blue plastic jewelry box features a white snowball on top with three pair of silver-tone stud earrings inside. 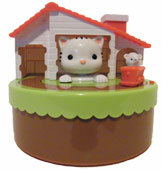 Jewelry box measures 4"x 4"x 3 1/2" and requires 2 AA batteries (not included). These Frozen talking plush come to life as they say their iconic phrases from the movie! Give each plush bean filled doll a squeeze to hear Anna speak 6 phrases like: "I never knew winter could be so beautiful" "Oops sorry I'm sorry" "But lucky you it's, it's just me". Elsa speak 5 phrases like: "Give me my glove" "I am your queen" "I just want to find my sister". Olaf speak 6 phrases like: "Hands down this is the best day of my life""I'm not going anywhere" and more. Each character sold separately! Collect them all! Each measure 8" tall and require 3 button cell batteries included. Give her foot a press and Grandma Cookie bear mouth moves as she recites her favorite gingerbread cookie recipe. She wears her red chef's hat and apron and holds the actual recipe card in her hand. Great gift for the chef in your life! Grandma Cookie stands 12" tall and requires 3 AA batteries included.